Learn about the art of Balinese cooking in quiet Lovina, North Bali. Here in our clean kitchen you will find classes that teach you the secrets of real Balinese food, in a pleasant and relaxing environment. You will create a range of traditional Balinese culinary delights and gain insights into Balinese culture. And in the end, you will eat the food you prepared yourself! 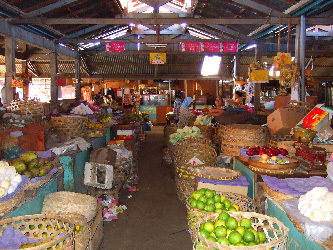 All classes include a trip to the local market and free transport in the Lovina area. 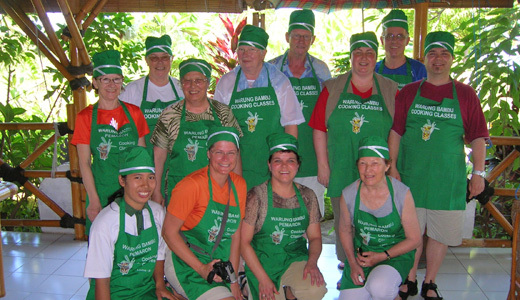 This is a good opportunity for beginners in Indonesian cuisine. 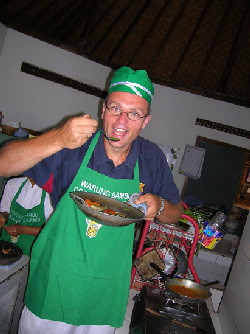 And for experienced cooks as well, because in every region in Bali the recipes are different – so try ours! In our restaurant you will learn about the Balinese way of cooking, in a basic kitchen. You will be astonished at how easy it is to "conjure" traditional food, if you know the secrets of the Balinese cuisine. We start with a well-known appetizer - Spring Rolls Vegetarian. In the class, you will learn all the dishes from the first step of their preparation to the last. How to prepare the pastes, the fillings, sauces and of course the ingredients of our tasty "bumbus" - the mixture of the traditional spices. Our Chicken Curry is cooked, like all our food, in the traditional way. Smell the indescribable aroma, when you grind Ginger, Candlenut, Laos, Turmeric and other spices together in the mortar. This class shows you more secrets of Balinese Cooking, but it is not more difficult than other courses and suitable for beginners, too. The Balinese and Indonesian kitchen is perfect for Vegetarians. Thanks to the use of the traditional mixture of many aromatic spices, it will enrich your way of cooking. And the tropics offer you a diverse assortment of vegetables, fruits and sprouts for your menu. But we promise - meat-eaters will not be bored as well! Tofu (soybean curd) is a bland, cheese-like cake formed from soy milk by adding a coagulant to the milk to form curds that are then shaped and pressed into cakes. Tofu is rich in minerals and is an excellent source of high-quality protein, polyunsaturated fats, B vitamins and iron. Tempe is made of whole, cooked soybeans infused with a culture to form a dense, chewy cake. It is a good source of fiber protein, polyunsaturated fats and lecithin, as well as calcium, iron, magnesium, potassium, and some B vitamins. Soybean sprouts are rich in vitamins A, B, C.
Soy sauce, the most widely recognized of soybean foods, is fermented from a mixture of whole soybeans, wheat flour and fermenting agents, such as yeast. To complete your knowledge in Balinese food and because it is soooo tasty – Balinese sweets! We believe, the big variety of Balinese sweets deserve more attention. The combination of palm sugar and coconut - the embodiment of a tropical dessert! And for sure you will be astonished by learning preparing the sweets. These desserts are really hard to translate, but be sure that some of them are very easy to cook in your country as well. Some are not, but they are all totally interesting and tasty. Some of the ingredients used are palm sugar, black rice, rice-flour and coconut. Learn about the “packaging” of Balinese desserts as well, for example in banana-leaves.